All cats need to be fully inoculated against Feline Influenza and Enteritis, which is boosted annually. Certificates of inoculations must be shown upon arrival. If a cat becomes unwell while in our care, veterinary attention will be sought and treatment commenced. In this event any veterinary costs will be charged to the owner upon return. The vets recommendations will be adhered to. 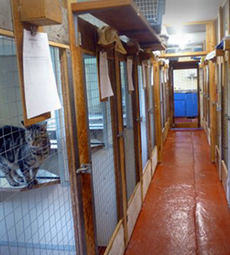 Cats must arrive and depart in secure baskets / carriers which can be stored at the cattery. We accept no responsibility for loss or injury. It must be clearly understood that animals are boarded purely at the owner’s own risk. Animals left for 14 days after the departure date without communication will be considered abandoned. All belongings left with animals (toys, rugs etc.) are left at the owner’s risk. If you have requested a collection or delivery, Fran will agree a suitable time. The charge will be £1 per mile (minimum charge £5) for the whole journey, and will be added to the bill. Please have the inoculation card and payment ready. This will save time and unnecessary stress to your pet. A suitable basket or container.